My spiritual journey of 13 years combines my two passions, crystals and healing my fellow human beings and has evolved since becoming an accredited and registered crystal healer and Crystal Sonic Rejuvenation™ therapist. 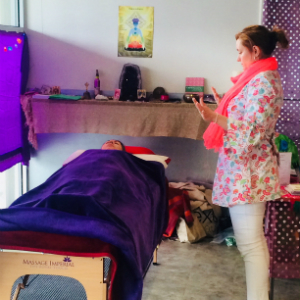 At a poignant time in my life, I felt the divine presence of Angelic energy and instinctively and now practice a deeper level of healing and teaching in my practice as a trained and qualified as an Angelic Reiki Practitioner and a Master Teacher, and a Priestess of the Goddess. We are all beautiful beings of light and love. We need to be connected to Mother Earth and I believe that crystal healing and meditation provides the connections to clear blockages inhibiting us from moving forward, revive our sense of self on many different levels, and embrace the person we’re meant to be. Crystal healing is accessible to everyone, regardless of race, beliefs or where you come from, as quintessentially we are all one. When I found my first amethyst in my grandma’s garden as a little girl, I became fascinated by and grew to love the power of crystals. As we travel through this journey of life we often get sidetracked into believing that material riches and certain status define who we are. We become tangled up in this web of disillusion, taking us away from our true purpose here on earth. This can leave your spirit undernourished, and without purpose. Qualified therapist, healer and trainer. 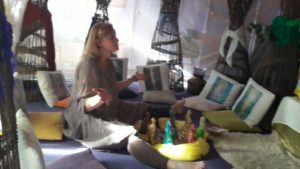 My spiritual journey over the last 13 years developing my learning and skills combines my two passions, crystals and healing my fellow human beings. 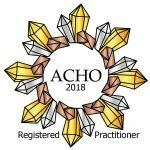 I studied at the Valerie Pitts School of Crystal Healing to become an accredited and registered crystal healing therapist with the Affiliation of Crystal Healers Organisations (ACHO). I also provide CrystalSonic Rejuvenation™, energy facial lift using ancient Chinese acupressure techniques and principles, sound healing and crystal therapy. At a poignant time in my life, I felt the divine presence of Angelic energy which had an extremely positive and life-changing impact on my life. Instinctively I started my training and qualified as an Angelic Reiki Practitioner and a Master Teacher. I feel truly blessed to be able to blend incorporate the beautiful Angelic Kingdom in my practice to enable my clients to heal on many different levels, reconnect and revive their true purpose. Enrich your spiritual wellbeing and meditation practices. I also attend Mind Body and Soul and Holistic shows. You can learn about these events and other activities on my Facebook and blog. Take a look at the upcoming workshops or events in 2018. Crystal Healing, the amazing mineral kingdom and my connection to the divas of the crystals and the Angelic realm of divine energy have changed my life completely in many positive ways. I hope it will do for you and I look forward to being a part of your healing journey soon.